Kevin Speaks met with us for a one on one interview about his role in the Maryland Lady Comets and his plans for the program. As the program director he gave us a good insight as to what they are trying to do. Coach: I guess it was approximately 10 years ago when I started coaching recreation girls league in the Edreco Recreation Program. Actually a year or two before I started coaching my youngest daughter was playing in the Edreco league and I noticed that most of the volunteer coaches were not ball players and really didn't understand the game. So I said once my daughter finished playing I would come back and help out because someone helped me when I was a kid. Coach: The Maryland Lady Comets is a GOD first Program that has been in existence for a little more than 8 years. It was started by Gordon Outlaw, Michael Dukes and myself. We are based in Baltimore City/Baltimore County area. 695: What challenges are you facing as an organization? Coach: We have been blessed not to have faced many challenges thus far. But a few that we have faced have been parent participation for some of our teams, parents/players not holding there daughter/themselves accountable to take what they learn in practice and work on those things on there own time. 695: What are your goals for the organization? Coach: Our program's goal is to assist our young ladies in becoming more skilled and fundamentally sound ball players. We strive to help our Ladies with life skills, character building and in education. 695: Who do you think the new NCAA residency rules will impact the DMV area? Coach: It doesn't matter much to me and I don't believe it will further impact the DMV area. 695: How do you feel about Maryland AAU in general? Coach: Our state tournament is just an opportunity for our ladies family and friends to get to see them play locally. As you know I'm normally out of town three weekends out of the month. I do think the cost is to much, other than that it's okay. 695: How do you plan your spring and summer schedule? Coach: I choose where we play each year first by selecting the best exposure tournaments that we can carpool to, then a couple of team camps, then I see which of the top teams in the country are hosting tournaments that we can drive to and that have a history of strong competition. In order for our ladies to get better they have to compete against the best in the country. 695: How do you feel about the overall direction of girls basketball in the area? Coach: Girls basketball in this area is on an unbelievable rise. There's so much talent just in Maryland alone. 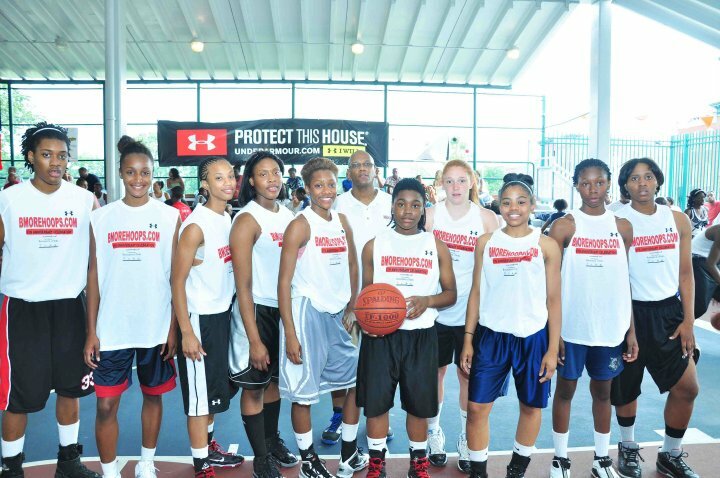 College coaches are very excited about the girls basketball talent in Maryland. 695: Who is your biggest influence on your coaching style and philosophy? Coach: There are so many coaches along the way that have coached me that have inspired and influenced how I coach. When I was in Junior College my coach was Jerry Phipps and he had us in the best shape of our lives. We played tough baseline to baseline defense, we ran and everyone could shoot well. As far as just wanting to coach girls basketball I was inspired by Coach Wardell Selby, who is a longtime friend of mine. 695: What do you do to stay sharp and improve your coaching skills? Coach: To stay sharp and improve my coaching skills I attend several coaches clinics, work camps and invest in instructional dvds from experience coaches yearly. As well as steal ideas, plays, concepts and drills from my peers. 695: How have you handled criticism that comes with coaching club/AAU ball? Coach: You know we will always have people who criticize you or AAU basketball itself and there are pros and cons. I knew when we acknowledged that we were a GOD first program that we would be attacked every now and then. One thing we know is that none of us are perfect. I think the biggest thing about me as a coach is that I genuinely love my players as if they were my own children. do you think that will impact the program? Coach: As far as A'Lexus Harrison from our 15u team verbally committing to Maryland in August that was huge for our program and we know it has made our program more visible this year. But mainly we are just excited for the wonderful young lady and her family to get the opportunity to play for Coach Frese. We are so blessed that our first group of Ladies are attending college this Fall and and look forward to our next group of ladies attending next Fall. Thank you and GOD bless.